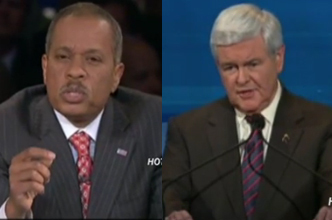 Newt Gingrich earned continued cheers in Monday night's South Carolina Debate after Fox News correspondent Juan Williams questioned Gingrich on his characterization of the poor. In the past, Gingrich has asserted that poverty-stricken children lack sufficient role models and referred to Obama as a "food stamp president." Juan Williams questioned: Speaker Gingrich, the suggestion that you made was about a lack of work ethic and I've gotta tell you my email account and my Twitter account has been inundated by people of all races who are asking if your comment was not intended to belittle the poor and racial minorities ... you saw some of this reaction during your visit to a black church in South Carolina by a woman who asked why you refer to Barack Obama as a "food stamp president." it sounds like you're trying to belittle people. Gingrich defended: First of all Juan, the fact is that more people have been put on food stamps by Barack Obama than any president in American history. I know among the politically correct, you're not supposed to use facts that are uncomfortable. Second, you're the one that raised a key point. The area that ought to be I-73 was called by Barack Obama a corridor of shame because of unemployment. Has it improved in three years? No. They haven't built a road. They haven't helped the people. They haven't done anything. So here's my point, I believe every American of every background has been endowed by their Creator with the right to pursue happiness, and if that makes liberals unhappy, I'm going to continue to find ways to help poor people learn how to get a job, learn how to get a better job, and learn someday to own the job.